What does this year’s senior class mean to the No. 9 Boston University men’s hockey team? Prior to the Terriers’ (18-9-5, 11-5-4 Hockey East) 3-2 win over the University of New Hampshire on Saturday night, the six graduating skaters took their turns shuffling along the red carpet that had been rolled out on the ice. 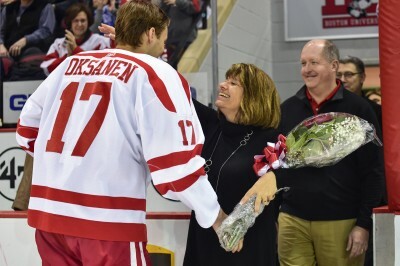 Most were escorted by their own parents, and one, Ahti Oksanen, was accompanied by Jeanne and Martin Ruikka, the parents of his freshman year defensive partner, Ryan Ruikka. 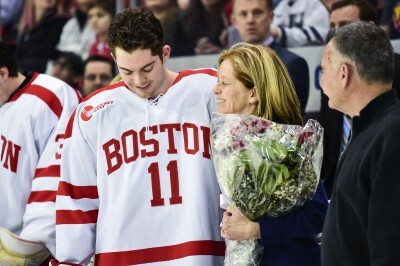 With bouquets of roses tucked into the crooks of their chaperon’s elbows, each senior prepared to hit the Agganis Arena ice for one last regular season game. In their four years with the Terriers, O’Regan, Oksanen, captain Matt Grzelcyk, assistant captain Matt Lane and forward Mike Moran have racked up a cumulative 184 goals and 255 assists for 439 points between them. On top of that, netminder Sean Maguire has posted a career .924 save percentage thus far, which currently leads John Curry’s school-record-holding .923 mark. And Saturday’s game against the Wildcats (10-16-6, 4-10-6 Hockey East) was no different. BU’s first two goals of the game were potted by seniors, as Grzelcyk and O’Regan converted during the first period, with Lane adding an assist as well. It’s a trend that has been a large part of the story of the Terriers’ season. Of the 297 points that BU has accumulated through its 32 games to this point, the seniors have accounted for 122 of them, or roughly 41.1 percent. In addition, 54 of the Terriers’ 110 goals have come off the sticks of seniors this year. 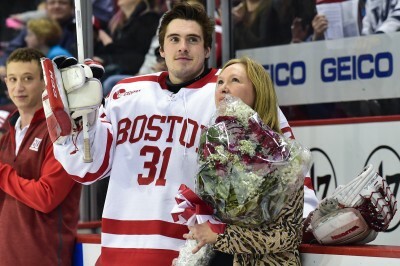 BU head coach David Quinn has reiterated over the course of the 2015-16 campaign how important it is to have a team’s senior class step up the way this year’s has. The seniors have led through example on the ice in terms of play and production, and have also done so through words in the locker room. After losing to the University of Vermont back on Dec. 4, the seniors called a players-only meeting the following morning prior to BU’s Dec. 5 rematch and relayed to their teammates what they expected going forward and what they needed to do differently. The Terriers won 5-3 later that night. “It’s a great sign for us moving forward when your seniors take control of a situation, and I got to give them a lot of credit, they really steered the ship right today,” Quinn said following the victory. And though their on-ice contributions are tangible and literally many in number, there are things the seniors do away from the ice for their teammates that stick out just as much. LaCouvee added that he and sophomore defenseman Brandon Fortunato were “chuckling” before Saturday’s game and talking about how irreplaceable this particular class would be. Quinn noted that these six players “mean so much to this program,” and that it “gets emotional,” but made sure to point out that they’re not done in this rink just yet.